Electronic Arts is using the Super Bowl 2010 to promote www.dantesinferno.com, a third-person action-adventure game based on the nine circles of Hell in Dante Alighieri’s 14th century epic poem, Inferno, part of the three-part Divine Comedy. Players must travel through the nine circles of hell to rescue Beatrice, whom Satan has stolen for his bride. The spot features a descent into hell accompanied by the Bill Withers track, “Aint No Sunshine”. Broadcaster CBS turned down the original 30 second ad, with concerns that the tag line, “Go to Hell”, would offend viewers. The newest version ends with the tag line, “Hell Awaits”. 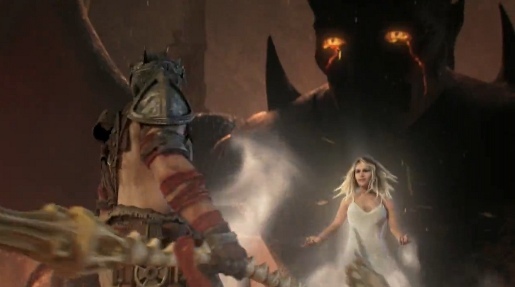 Electronic Arts has been building up to the February launch of the Dante’s Inferno game with a “nine months of hell” marketing campaign, launched in May 2009. Visceral Games, the developer of the game, created “Go To Hell,” a Dante’s Inferno-themed application that lets users condemn their friends, groups, or photos to one of the nine circles of hell. They can then vote to punish, absolve or torment them. See the Dante’s Inferno teaser, released in February 2009, produced by G-Net and Psyop. The Dantes Inferno Super Bowl campaign was developed at Weiden+Kennedy, Portland, by creative director Jason Bagley, Eric Baldwin, copywriter Charles Gschwend and Kevin Jones, art director Dominic Orlando and Adam Heathcott, producer Endy Hedman, executive creative directors Susan Hoffman and Mark Fitzloff, agency executive producer Ben Grylewicz. Filming was shot by director Tim Miller via Blur with executive producer Al Shier, producer Lindsey Zamblas, layout artists/editorial supervisors Franck Balson and David Nibbelin, editorial supervisors Franck Balson, animation supervisor Brian Whitmore, VFX supervisor Kirby Miller, hair supervisor Becca Baldwin and cloth supervisor Jon Jordan. Audio post production was done at Eleven by mixer and sound designer Jeff Payne, with producer DJ Fox-Engstrom. The game was produced by Justin Lambros and assistant produced by Zach Mumbach.